The owner and founder of The Dog Café, Sarah Wolfgang, was inspired by the many dog cafés in Korea where she grew up; those cafes do not allow dog adoptions. Being involved with animal rescue in the United States, she was able to combine these two interests into one, brewing up The Dog Café. Its grand opening was in April 2016 and they’ve been rescuing pups ever since. 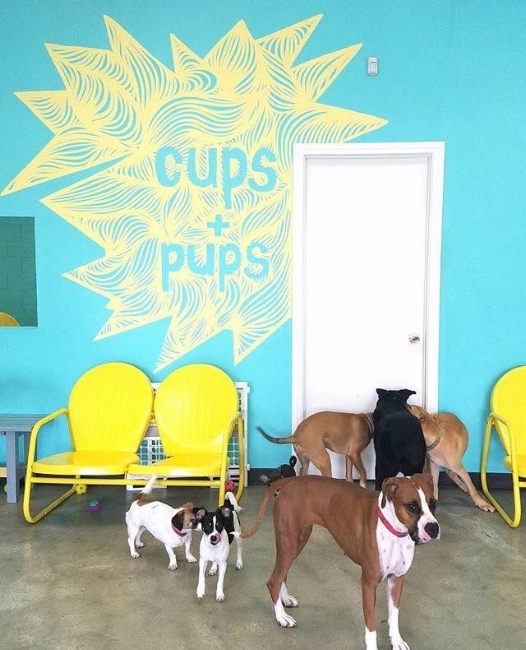 The Dog Café’s supervisor, Kennedy Williams, describes the café as “a place where you can see the dogs in their actual environment and for who they are rather than behind a kennel.” With a $15 admission fee (drink included) you’ll have an hour of adorable doggy overload. The café comes to life with its bright turquoise walls and adorable doggy portraits. You’ll find an array of dogs here from small to large and young to old. The café has two completely separate rooms, one which allows the dogs to run freely and the other where your coffee, tea or lemonade is made fresh daily. For coffee, you have the option of ordering an americano, espresso, pour-over, macchiato or cafe latte. For tea, there are the options of Earl Grey, green tea (regular or latte), chai tea (regular or latte), chamomile and peppermint. As for lemonade, they serve original, lavender, rose and ginger. They also serve carob latte and carob milk. Carob is part of the pea family often used as a substitute for chocolate. They also offer seasonal drinks such as the pup-kin spice latte. The café shelters anywhere from eight to 15 dogs at a time and you’ll often find them lounging on comfy sofas, chewing on toys or enjoying plenty of hugs and kisses from visitors. Many of the dogs come from troubled backgrounds and often need more time adjusting to people, but volunteers are encouraged to apply as foster parents to help expose the dogs to life outside of the café. The process to become a foster parent is similar to applying for adoption; the only difference is that the volunteer is not finalized as the dog’s owner. A phone interview is scheduled as well as a house check to insure the dog is matched with the right person. The adoption process takes about a month and the fee ranges from $200 to $600, depending on the dog. Aside from adoption or becoming a shelter parent there are also other ways to help. The Dog Café recently became nonprofit, so they now accept donations. You can also pay the café a visit; the $15 admission fee and adoption fee are what help keep the café running. A coffee shop this cuddly is hard to pass up. The Dog Café is located at 240 N. Virgil Ave., Los Angeles and is open Wednesday through Sunday from 11 a.m. to 7 p.m.